Gluten-Free Living > Gluten-Free Lifestyle > SPONSORED POST: Celebrate the Holidays With The Maine Pie Co. SPONSORED POST: Celebrate the Holidays With The Maine Pie Co.
For most families, holiday traditions center around cooking, baking, and sharing food. For gluten-free diners, however, food-focused holidays can be downright difficult. With our delicious gluten-free pies, The Maine Pie Co. has set out to make holidays, special occasions, and family dinners delectable for everyone. Meet The Maine Pie Co. The Maine Pie Co. is committed to making the best gluten-free pies for the holidays, special occasions, and everyday treats. Our artisan-made pies and tarts are prepared with care in a dedicated gluten-free facility in the historic Pepperell Mill in the heart of Biddeford, Maine. All of our pies and tarts are tested using the ELISA method for gluten and test under 5ppm. We are also working toward gluten-free certification to give our customers added peace of mind. Founder Jill Miller heads our small but mighty team and lends more than a decade of baking experience to our women-owned and -operated business. Jill founded The Runcible Spoon in Nyack, New York, and Port Bakery in Kennebunkport, Maine, where she developed her award-winning gluten-free pie recipes. Celebrate With The Maine Pie Co. Whether you have longstanding family traditions or are creating new ways to celebrate, there’s always room for The Maine Pie Co. at your holiday table! Rich and dense, our pecan pie puts a unique New England spin on a southern specialty. A sweet filling highlighted with crunchy pecans, Madagascar vanilla and non-GMO corn syrup makes this pie sure to please everyone at the table—whether gluten free or not! Give thanks for the most delicious gluten-free pie! Packed with pumpkin and a rich blend of spices, one bite will remind you of autumn days spent with family and friends. 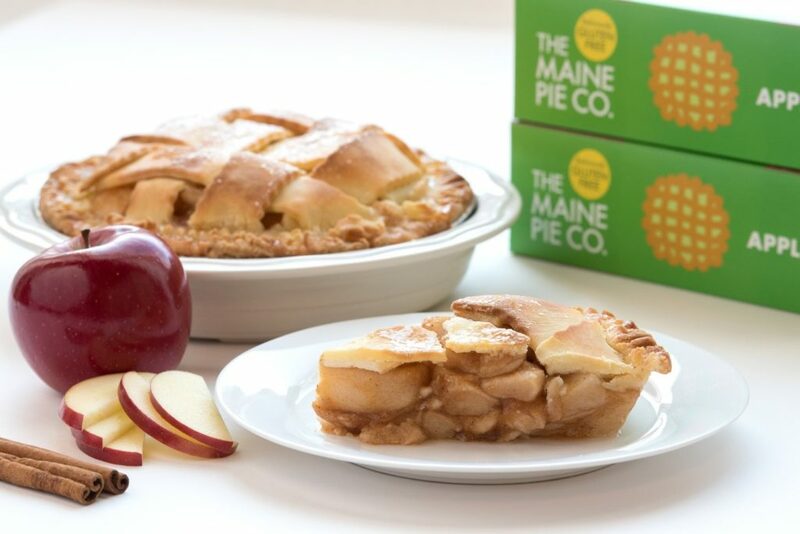 At The Maine Pie Co., it’s always apple pie season! An American classic, our apple pie mixes cinnamon, nutmeg and clove with the flavor of fresh, crunchy apples. Our apples are locally sourced and peeled, cut and made into pies the very same day. Nothing is better than a slice, warm from the oven with a scoop of vanilla ice cream. Where to Find The Maine Pie Co.
You’ll find our fall and year-round pies at Whole Foods Markets, Hannaford and many other natural food stores in the Northeast. We’re always working hard to share our gluten-free pies with the largest possible audience, and we’re proud that Kroger stores and Harris Teeter will soon be carrying our pies across the U.S. Please use our Store Locator to find a store in your neighborhood. In case you don’t live in an area where our pies are sold, no worries, we are available online at www.glutenfreemall.com and will be delivered right to your front door!